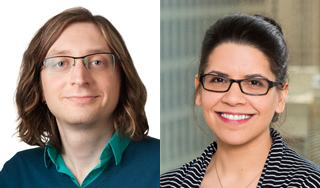 Gregory Phillips II, PhD, MS, and Michelle Birkett, PhD, research assistant professors of Medical Social Sciences, have been awarded a five-year, $3.3 million grant to help develop a software tool that will simplify and streamline social network data collection related to HIV transmission. Northwestern Medicine scientists are developing a software tool that will simplify and streamline social network data collection related to HIV transmission with funding from a five-year, $3.3 million grant from the National Institutes of Health (NIH). Michelle Birkett, PhD, and Gregory Phillips II, PhD, MS, research assistant professors of Medical Social Sciences and co-principal investigators, plan to advance networkCanvas, a software framework developed by their team to better understand how HIV transmission is influenced by social and contextual systems. Using the existing networkCanvas framework allows for the quick and accurate data capture of complex network and contextual data from research study participants through an interactive touchscreen interface and user-centered design. Using networkCanvas, the scientists plan to develop and sustain a standalone survey administration tool, which will not only allow for the capture of multilevel network, longitudinal, geospatial, contextual and behavioral data, but also enable the capture of these data without any advanced technological expertise. “We are trying to help simplify the collection and streamline the management of social data, thereby allowing health and HIV researchers to assess more nuanced associations between contextual factors and the spread of infectious disease. This also increases our ability to utilize these data in real time,” Phillips said. Birkett and Phillips, both faculty within the Institute for Sexual and Gender Minority Health and Wellbeing, are currently collaborating with an interdisciplinary team of experts in the areas of population health, HIV, network analysis and computational science from Oxford University (Joshua Melville, Msc and Bernie Hogan, PhD), Emory University (Natalie Crawford, PhD) and Johns Hopkins University (Cui Yang, PhD). The award is the first R01 awarded to Northwestern University through the NIH’s Big Data to Knowledge Initiative which seeks to enable biomedical research as a digital research enterprise, facilitate discovery and support new knowledge and maximize community engagement. The project is supported by NIH grant 1R01DA042711-01.